1,000 and 2,000 LB Cap. 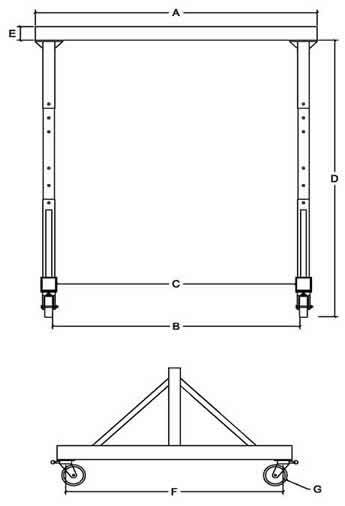 P Model Gantry | EC & MW, Inc.
EC&MW, Inc. first came up with the concept back in the mid-1990s of preforming height adjustments from both the base and the I beam. The whole concept really hasn’t caught the eye of a lot of people, but it really does fill a unique niche. First, this gives the gantry crane better versatility by providing more than the standard 5 holes for height positioning. Our smaller model only provides 29” of height adjustment, but there are advantages to that. Second, the base height is only 34” high, so when we designed this portable gantry crane we made it “A Truly Portable Gantry Crane”. As you can see below, the entire crane EASILY fits into a Dodge Caravan. Third, the smallest model in its lowest position is only 63” under the beam and 92” in its highest position. Add a 4” I Beam and your top of beam height is 96”, which is ceiling height for many types of rooms. The hole spacing’s were again by design. Base hole spacing’s are different than I beam spacing. Bases are spaced at 5 1/8”, I beam are 4 ¾”. Why this design? To avoid obstacle’s in the ceilings, sprinklers, halon fire suppression systems, detectors etc. One more reason was for setting up your gantry crane on two different floor levels. Fourth, smaller beam length cranes can be assembled by just one person. Try doing that with another manufactures A Frame gantry cranes. So, think outside the box and give this style crane some serious consideration. 1,000 lb. cap. and 2,000 lb. cap. Show above in its cart assembly. Our 2P88 has an optional unique cart assembly. 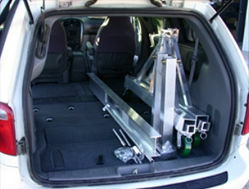 This includes steering handle, cross bars, bungee cords, and clip pins. This feature eliminates the need for several trips from the parking area to your work area. Assembly is quick and easy. The cart assembly also makes our gantry easy to store, by keeping all the components together. Notice how extension tubes fit neatly inside the bases. When using the gantry, the steering handle and all of the components fit in the bases, eliminating interference in your working area. Our 2P89 and SB models gantries leave plenty of room for tools and spare parts in service mini vans. Overseas shipping is no trouble. We have shipping world wide for 20 years. We at EC&MW, Inc. and Hospital Rigging Supply, Inc. have always considered “Safety First” as a number one propriety. The purpose of the “Safety First” content is to promote safety through the use of correct operating and maintenance procedures. Warning! It is your explicit responsibility to consider all risk factors prior to using this or any rigging device or product. To avoid injury, read and fully understand this information before using this product and follow OSHA and ANSI guidelines. Owner must ensure that all users are trained on the use of this or any rigging product. Use by untrained persons is hazardous. Improper use could result in serious injury, death and or property damage. All rigging products will fail if damaged, abused, misused, overused or improperly maintained. Never use gantry for lifting or supporting/moving humans or lifting or supporting loads over humans. Never use gantry without all hitch & lynch pins and additional hardware secured in place. Never makes any adjustments while gantry is in use or under load. Never slings loads over top of I beam. 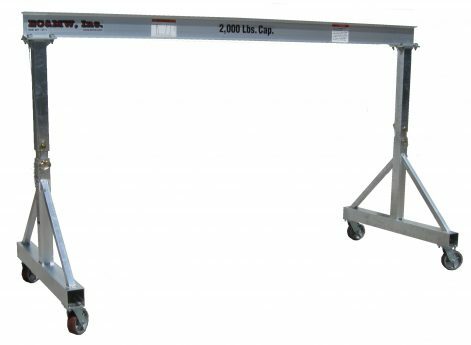 Never use/roll loaded gantry over any uneven surfaces or on any inclines. Never push or pull the gantry with a lift truck or any other vehicle. Never leave any load suspended in the air unattended. Never work under a suspended load. Never allow load to swing or come in contact with any portion of the gantry. Never place feet or other objects under bases as extension tubes may pass through the base to the ground. Never force or hurry your work or equipment. You and your equipment will do better and safer at the rate for which it was intended. Never use any product exhibiting deformities, as defined by OSHA 1910.179. Inspection must be performed by certified personnel. Any unusual wear or deterioration must be immediately replaced or repaired. Never store gantry where corrosives chemical or solvents are kept. Never position trolley or hoist assemblies on outside of gantry legs. Always inspect gantry prior to each use for missing or damaged parts. Always when moving the loaded gantry, push on the gantry not the load. Always when moving the loaded gantry, keep load as close to the floor as possible and positioned in the center of the I-beam. Always when moving loaded gantry push/pull simultaneously on both gantry legs. Not on the load. Always limit your speed to less than 1 1/2 miles per hour when moving gantry crane. Always position: I-beam/hoist & trolley directly over center of load before lifting. Always stand to one side of I-beam when assembling/disassembling or making any height adjustments. Always remove trolley and hoist when assembling or disassembling gantry. Always make certain that the load is not attached to the floor and any obstacles that may impede lifting have been removed. Always make any adjustments and or repairs in an area where it will have the least interference with the operation. Always make certain that all operating and safety instructions for all rigging equipment have been read and fully understood. Always make certain all caution/warning labels are in place and legible before each use. Always verify that the rated capacity of the gantry is clearly marked on each side of the I-beam before each use. Always keep visitors a safe distance from work area. Always keep work area clean. Cluttered areas invite accidents. Always watch what you are doing. Use common sense. Always store gantry in a safe and dry area, which will be free from weather and foreign materials. Always check that all I Beam clamps/top cap bolts are torque to: 1/2” 13 thread to 51 ft lb. 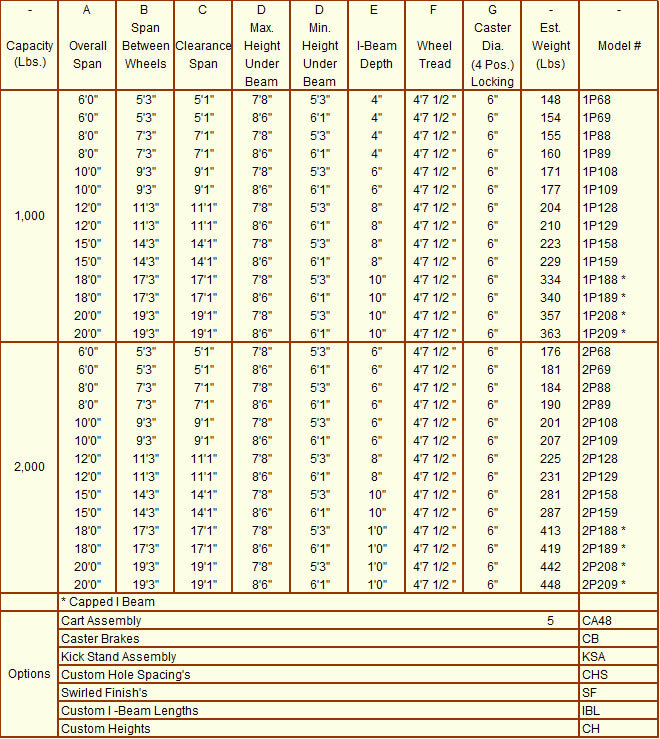 each or 69 nm (newton meters). 5/8” 11 thread to 108 ft lb. each or 146 nm (newton meters). Warning! Gantry will conduct electricity. Gantries with the letter “C” at the end of the model number: Some instructions may or may not pertain to that particular crane. Call for verification. Check air pressures in all tires before making any lifts with gantry. “If Low” Equally inflate to proper pressure(s) before using gantry crane. Some models require the use of diagonal leg to beam braces. Never use gantry without braces. Refer to your owners manual for specific instructions. The use of some of our gantry crane models have the ability to be used on minimal uneven surfaces. But is still limited to moving crane by hand only. Always verify labeling before using gantry crane. Some of our gantry cranes when used improperly can exceed our height to width ratio. If your gantry is equipped with crank down jacks. 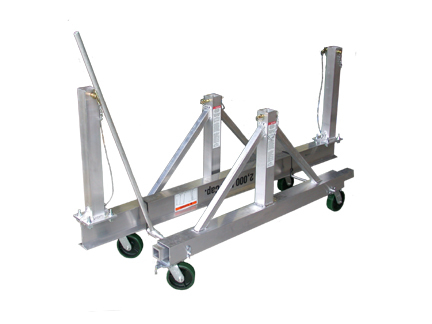 Raising loaded gantry is limited to raising no more than 1″ at one time per jack. Until desired height. It shall be the owner’s responsibility to maintain all warnings and instructions and to see that they are intact, as well as legible. Free replacement labels are available upon request. When moving loaded gantry observe all wheels are rolling freely. Excessive force should never be used when moving gantry. Always replace any missing hardware immediately, with exact Grade, Length, Diameter and “Thread”. Never replace with substandard hardware! You must understand these instructions and warnings prior to use. If you, as the owner or user, do not understand English, it is your responsibility to have all the instructions and warnings interpreted into your native language for full and total comprehension. All users must understand OSHA regulations, ANSI standards and relevant regulations. Destroy gantry if exposed to fire or corrosives chemicals. The safety instructions put forth above were in effect at the time of publication. However, owing EC&MW, Inc. & Hospital Rigging Supply, Inc. policy of continuous improvement, changes to these instructions may be made at any time without obligation on the part EC&MW, Inc. & Hospital Rigging Supply, Inc.
Due to our large diversity of past and present aluminum gantry crane designs, EC&MW, Inc and Hospital Rigging Supply, Inc. cannot assume that all acceptable safety measures are listed or that other additional measures are not needed under particular or exceptional circumstances or conditions. This information and recommendations contained herein come from sources we believed to be reliable and to represent the best current practice. EC&MW, Inc. & Hospital Rigging Supply, Inc. does not intend this page to be a complete course of instructions on how to use this gantry with complete safety and does not guarantee or represent that the information is absolutely correct or sufficient.